Thank you to our elite sponsors! For players 4 years old through 18 years old (in HS). Registration for this Spring season is closed. We will open registration for Fall 2019 in Late April. Mark your calendars and check us out on facebook. We'll have early bird discounts too!! Don't forget player uniforms and Coach jerseys for the current season ARE included in the cost of your registration for players and volunteer Coaches. If you did not get yours at the Meet & Greet, they will be available at the EWSA tent at the KSP fields on Saturdays through March 23rd. Have more quick questions, see our FAQs HERE or our calendar for the rest of the season. 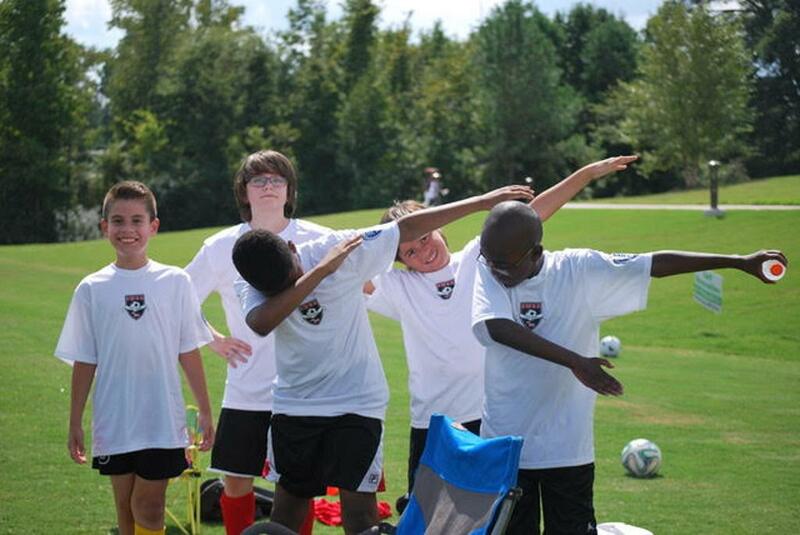 U12 Boys - Doing the Dab on the sidelines! We make it easy for parents and other volunteers to step into a coaching role and we are always looking for more as we grow our league. On the field training, online coaching resources and tools are provided to make each coach successful regardless of your previous experience level! EWSA is a community focused, not-for-profit that runs strictly on volunteers. The board of directors, folks setting up the fields and of course COACHES are all volunteers. Come make a difference in your community and in a child's life. If you are interested in coaching a team, please contact our Programs Director, Lisa Kucma @ lisa.ewsa@gmail.com. Celebrating 38 years of serving Eastern Wake County! Interested in being a EWSA Sponsor? Contact Ed Guinco, current President of our league and explore all the possibilities. From small in-kind donations to corporate sponsorships, we welcome the community support! At the Knightdale Library - - Fast Friends - - All because dad decided to coach. We make it easy for you to make this difference in a child's life. Consider coaching. Interested in Competitive Travel Soccer? We partner with Johnston United Soccer Association (JUSA), Archer Lodge Athletics (AL) and United Soccer Club (USC) for Recreational Games throughout the season. If you are interested in more competitive play, like Academy or Classic level of play, please contact Neuse River Futbol Alliance (NRFA). Knightdale Elementary School - Closed as of 4/13/2019 for the weekend. Knightdale Station Park - Closed as of 4/13/2019 for the weekend. In addition to our elite sponsors above, these fine organizations make what we do possible. Please show your support to these amazing sponsors and thank them for their commitment to our organization. Click here to learn more about our sponsorship opportunities. ©2019 East Wake Soccer Association / SportsEngine. All Rights Reserved.